Janos Donacien returns to Accrington. I see Accrington Stanley have re-signed defender Janoi Donacien on loan, only two weeks after he completed his £750,000 move to Ipswich Town. What a waste of time and money that transfer was but as it was no fault of his own I wish him well. Re: Janos Donacien returns to Accrington. Odd one this as I actually think he did ok at times, better defensively than bloody spence. Maybe no club wants Spence, at least we’ve off loaded Donacien’s wages, or at least part of them. I also read somewhere that we’ve recalled Josh Emmanuel from his loan spell at Shrewsbury, doesn’t this also strengthen our position at full back or is it simply that he wasn’t getting used at Shrewsbury? Shrewsbury couldn't guarantee him game time which 8s hardly a glowing endorsement, RB is still an issue but for me Pennington played very well there last week and is the best option atm. I think you're probably right about Pennington being the best option at the moment. I still feel the fullback positions are the weakest on both sides of the pitch. Can't agree more. Accrington must be laughing their heads off. I reckon he has played his last game for town and may well end up as our most expensive player in history for cost per minutes played. No, I can see Ulrich Le Pen hanging onto that one! Yeah I remember that waste of money,played about 15 minutes, think it was against Leeds ,got injured, never played again & cost a fortune. 12 minutes of league football for £1.4 million. How about Steve Stacey. Anyone remember him? Given inflation I don’t think there can be much to choose between the two, £1.4m in 2001 can’t be worth much more than £750k in today’s money and i’d suggest we were far better off 17 years ago and could far more easily swallow the loss. Furthermore in addition to Le Pens 12 minutes on the pitch for a league match we also got an FA Cup tie and a UEFA Cup appearance out of him before he left on a free transfer. Either way they were both a definite waste of money. Actually I can remember him Barmy although to be fair I wouldn’t have without being prompted. Signed from Wrexham for £28,000 and made his debut at Portman Road v Liverpool on 14 September 1968. I remember him being signed and I would have been at his debut game as I never missed a home game that season. I can’t remember much about him other than being a bit of a clumsy lump. 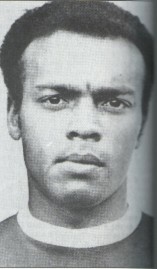 I think he was also the first black player to play for Ipswich Town first team although Johnny Miller would have been around at the time but yet to make his debut.